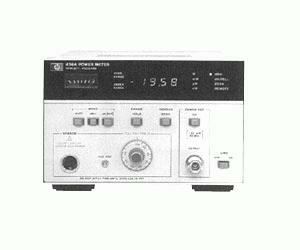 The Agilent 436A power meter is a general-purpose digital power meter intended for manual and automatic radio-frequency (RF) and microwave-power measurements. It is compatible with the entire series of 8480 power sensors. The 436A measures either absolute or relative power. It displays absolute power in either watts or dBm, and relative power in dB. The 436A offers intuitive and straightforward manual operation as well as optional GPIB programmability (Option 022).